Our Award Winning Creamy Clam Chowder is chock full of tender sweet clams, with just the right amount of potatoes in a rich & creamy flavorful broth! Chock full of tender sweet clams, with just the right amount of potatoes in a rich flavorful broth this Clam Chowder Is An Award Winner! Simply put, you're going to love it! 18 oz. Clam Chowder Serves Two. 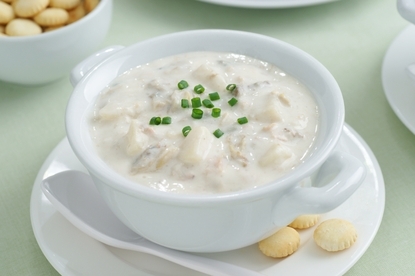 Order Our Award Winning Clam Chowder By 10am EST, And Enjoy It For Dinner Tomorrow! Our Chowder Also Make A Great Gift Idea For Your Favorite Seafood Lover! How Easy Is That! This chowder is absolutely delicious and the best I have had yet. This chowder is exactly how I like it. Creamy and chock full of clams. Will be ordering again soon along with some two pound live lobsters! Yum! We sent this as a gift and were told it was perfect in every way--and this was from a real clam chowder critic. It was a hit! Your description is perfect! You were not kidding! This is the best clam chowder ever!